Supposedly if I tag a post “linkedin” it will show up and spam everyone on my LinkedIn. That sounds wicked. Edit: The URL I had to use was http://www.evanhoffman.com/evan/tag/linkedin/feed/ (it kept looking for /?feed=rss2&tag=linkedin which didn’t work properly). One of the more annoying side effects of migrating my mailbox to Exchange 2010 has been the nagging of Outlook 2007’s Autodiscovery feature. 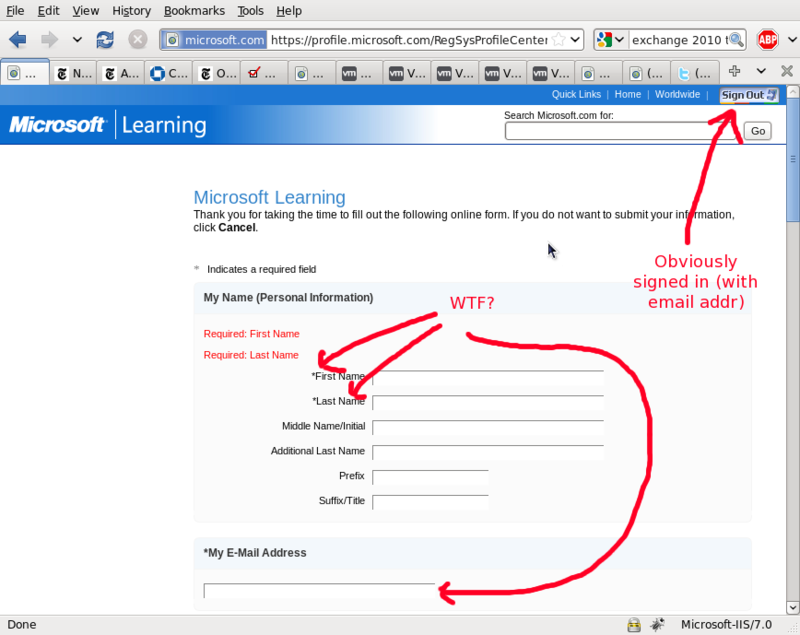 Now, every time I start Outlook I get hit with a certificate error for autodiscover.domain.com. Now, autodiscover.domain.com is a CNAME to mail.domain.com, which is the OWA URL for the CAS. The SSL certificate is valid – but it’s valid for mail.domain.com. I could buy a SSL certificate from GoDaddy for $12.99 (an insanely great price, btw) for “autodiscover” but that would also require using another IP address on the CAS (since you can can only bind one SSL certificate to an IP:port pair), and that seems like a waste of an IP address. You’d replace mail.contoso.com with the external URL of your OWA server (in my case, mail.domain.com). I’ve made the changes but I think I need to wait for AD propagation. Hopefully this will resolve it, because I don’t want to move everyone’s mailboxes over until this thing is “perfect,” whatever that means. Edit: I also needed to add a SRV record so Outlook would know what host to check for autodiscovery when outside the domain. Edit 2:: Also need to install a hotfix or be running Outlook 2007 SP1 or later for the SRV functionality. Edit 3: It occurs to me that a simpler fix for this issue may be simply to delete the DNS record for autodiscover entirely. That way, when Outlook attempts to open the SSL connection to autodiscover.domain.com, it gets a NXDOMAIN error (should) silently skip it. Unfortunately we have wildcard DNS active for our domain. MS Exchange Team blog post comparing the various autodiscover schemes. Example Autodiscover BIND record – _autodiscover._tcp.domain.com. SRV 0 0 443 webmail.domain.com. What version of Outlook am I running? You need SP1 or later for the SRV hack. I’m already logged in, why do I need to input all my info again? Including my email address, which was required to login? This was a lot more work than I expected. Then again, I am a newb. And lazy. I don’t really know why I put this blog up, but generally I write stuff here after I muddle through some ridiculous problem that may have ended up being easily resolved, but whose solution was hard to find. That’s definitely the case with this post. Currently I’m in the middle of moving my company’s email from Exchange 2003 to Exchange 2010. Microsoft has provided some pretty good documentation on how to do this, but they do assume a certain level of familiarity with the product. For example, I probably spent 30 minutes trying to run Exchange cmdlets in Powershell before I realized there’s a special shell just for Exchange, the Exchange Management Shell. ‘EXCH2010FE1\Microsoft-Server-ActiveSync’ couldn’t be found on ‘activedir.example.com’. This appeared to execute successfully, but I don’t know if it actually did what I intended, so I stuck with specifying the identity manually.